For the American Idol contestant, see Heather Cox (singer). Heather Cox (born Heather Schoeny on June 3, 1970) is an American sportscaster who is a sideline reporter for NBC. As Heather Schoeny, she played college volleyball at University of the Pacific. Heather Cox returned to NBC Sports for her second Olympic assignment as beach volleyball reporter. 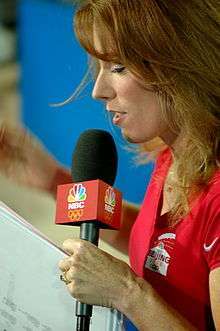 She made her NBC debut reporting from both the volleyball and beach volleyball competitions at the 2004 Athens Games. From 2003 until its end, Cox served as a reporter on NBC's AVP pro beach volleyball coverage. Cox worked as a columnist for the Pac-10 Conference, writing a weekly national volleyball column in 2000. From 1999 to 2000, she served as a reporter on Running with the Pac magazine show. Cox began her broadcast career as a basketball analyst for Fox Sports Net in 1993 and covered college football, professional basketball and volleyball during her tenure at Fox Sports Net. A volleyball veteran, Heather Schoeny Cox graduated from the University of the Pacific with a degree in communications in 1992. Her collegiate athletic career included four years (1988 to 1991) on the University of the Pacific (Division I) women's volleyball team, serving as team captain on a team that was ranked in the top five nationally from 1988–91, reached the Final Four and was a National Championship runner-up in 1990. Cox was a member of the United States National Volleyball Team from 1987 to 1995 and competed at the United States Olympic Festival in 1990. Cox played professional volleyball in the National Volleyball Association as team captain of the Sacramento Stars. During the 2016 Summer Paralympics in Rio de Janeiro, Brazil, Cox served as a poolside reporter for American Paralympic broadcaster NBCSN during the swimming competitions at the Paralympics. Cox is the recipient of the 2004 USA Volleyball E. Douglas Boyden Media Recognition Award. ↑ McIntyre, Jason. "Samantha Steele to Replace Erin Andrews as Host of Gameday on ESPNU; Heather Cox New Saturday Night Sideline Reporter". thebiglead.com. Retrieved July 11, 2012. ↑ "NBC Olympics Announces Commentators For 2016 Rio Paralympic Games". Team USA. U.S. Paralympics. Retrieved 17 September 2016.